Honored to be Awarded #1 Winery in California! Wise Villa Winery is the “Golden State Winery of the Year 2015”, awarded by the California State Fair, the oldest and one of the largest & most prestigious blind wine competitions in the United States. Wise Villa Winery had the highest number of high scoring wines competing against thousands of wine entries from wineries across the state. The California State Fair presented the award at the Governor’s Office & was acknowledged by the CA State Senate and Assembly. Wise Villa is the only winery in Placer County to have a full service bistro and commercial kitchen. We have created a truly unique European setting in the lovely Sierra Foothills where guests can enjoy an internationally themed food & wine pairing experience. 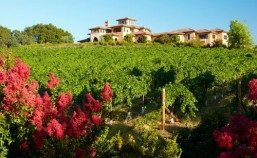 Our beautiful Tuscan-style bistro & elegant wine tasting room are designed with European architecture & ambiance that feature scenic views of our rolling hills vineyard & the Sacramento Valley. Our wine educators & professional waitstaff provide the ultimate full service experience while our gourmet chef & culinary team artfully create delicious dinner entrees, decadent desserts & gourmet small plates. We have special events & fun-filled parties every month at our winery. Join us for an educational 7-course Pairing Dinner or a Wine Blending Party & Steak Dinner both hosted by owner & co-winemaker Dr. Grover Lee. Enjoy exciting events like the Lucy Grape Stomp, Hawaiian Luau, Harvest Moon Party, & World Malbec Day. We also hold uniquely themed parties throughout the year which include great food, live music, games & dancing! Celebrate your favorite special occasions, weddings, anniversaries, birthdays, business retreat dinners & much more at Wise Villa! Your group, whether large or small, can enjoy gourmet food & fine wine in the comfort of our wonderful dining room & charming courtyard, which boasts a prime view of our beautiful rolling hills vineyard & breathtaking sunsets, or enjoy your special day on our beautiful wedding lawn or inside our unique underground barrel room & winery. We welcome you & your loved ones to share our passion for wine by becoming members of our wine club. As members you will receive exclusive benefits, great discounts on wine & monthly events, invites to wine club parties, access to member exclusive wine, free wine tasting for you & up to four guests & much more.